On Sunday June 10th there were cyclonic winds across the whole of the southern part of Western Australia and due to the fact that all of the power is still above ground there were significant outages. Over 160,000 households were affected and days later there are still power lines down and power outages. Thankfully here in Broome we have mostly underground power, so when a cyclone hits there are very few poles that can fall over or get hit by trees. 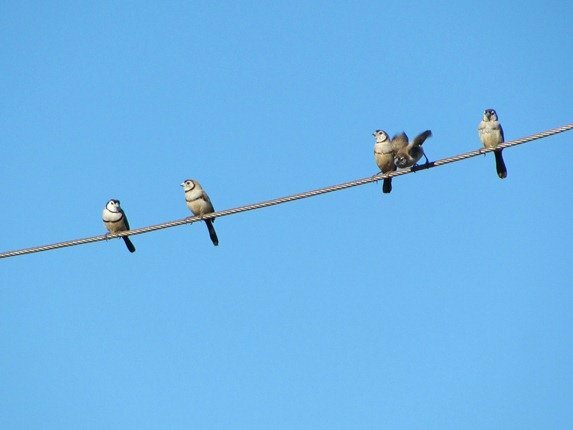 We live in an area that has underground power, but there are still above ground transformers and the birds love to line up on the nearby line. When we first moved into our new home we were concerned that some species of birds would not be happy to stand on the wooden fence. We had a long length of stainless steel cable that would hopefully appeal to birds and we decided to install it above our back fence. We had to use spacer posts due to its weight and believed it would be several days before it would be used….how wrong we were! Within 30 minutes of installation we had visitors! What a success! Over the years we have moved it along due to a native tree growing so well, but it is used daily. It is used as a stopover on the way into the garden and it is used to catch the last of the sunshine in the evening. 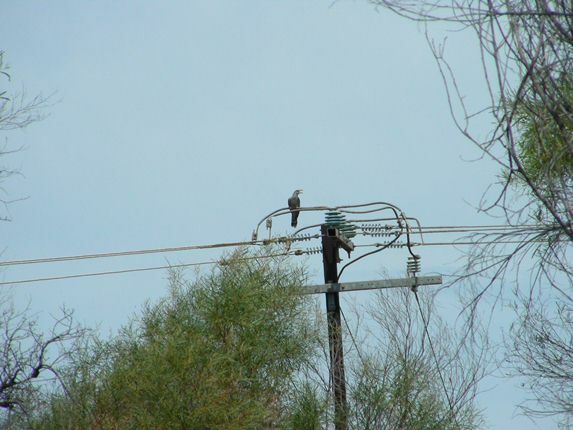 One of the best birds we have had on the nearby transformer is a Channel-billed Cuckoo. There were in fact two of these very large birds that were calling for the adoptive parents, Torresian Crows, to feed them. 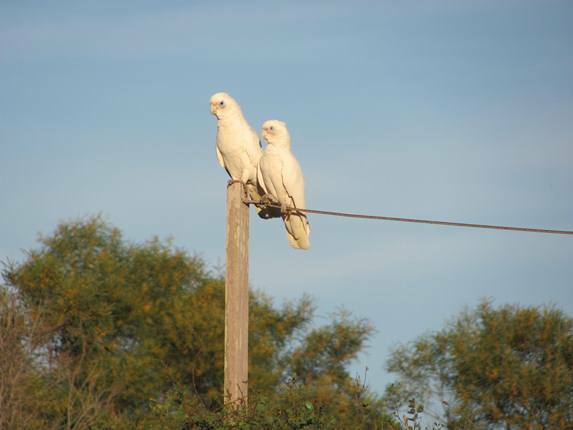 The Little Corellas like to stop over & have a look and then enter the garden after playing on the line. They walk around the garden checking it out and then move on. 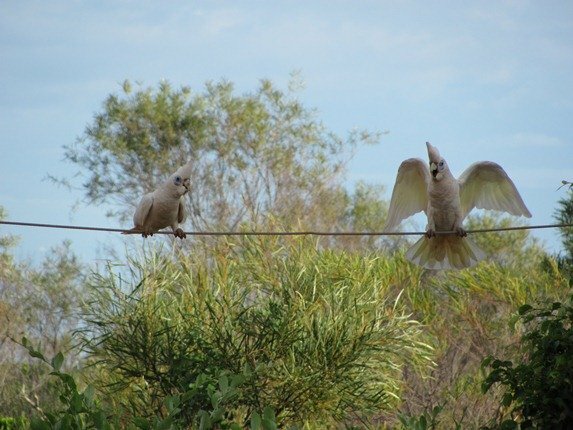 Little Corellas stopping over for some fun! Our first Long-tailed Finch in many years entered after a brief stop on the line. Double-barred Finches like to line up together and then use a native bush close by to shelter before heading to our watering points. They have discovered the bush is ideal because it is too dense for the Goshawk to enter! The young finches have not yet developed their “bars”. 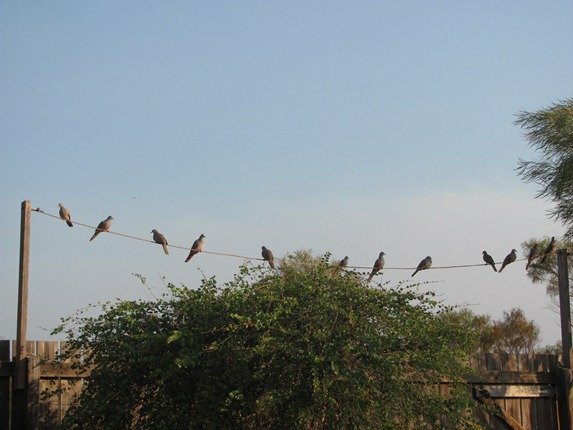 In the late evening the Bar-shouldered Doves line up and enjoy the last of the warmth. The Bauhinia bush below is the favourite shelter for the finches. If you don’t have a power line near your home you can always consider a pretend one! Oh, that’s brilliant! 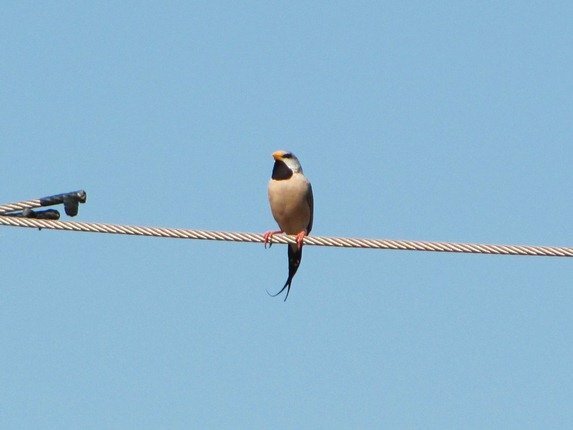 The cable looks to be just the right gauge for birds. Much better than a washing line. Wonderful photos and birds! What a cool pretend power line! I love your pretend power line post. Contratulations.